Casa Patron is a great villa if you and your guests want plenty of space in a gated community. The bedrooms are spread throughout the home, but a couple are located next to each other for families or children to share. Casa Patron is also close to several restaurants, so you can spend the evenings around your private pool or tasting the local cuisine. 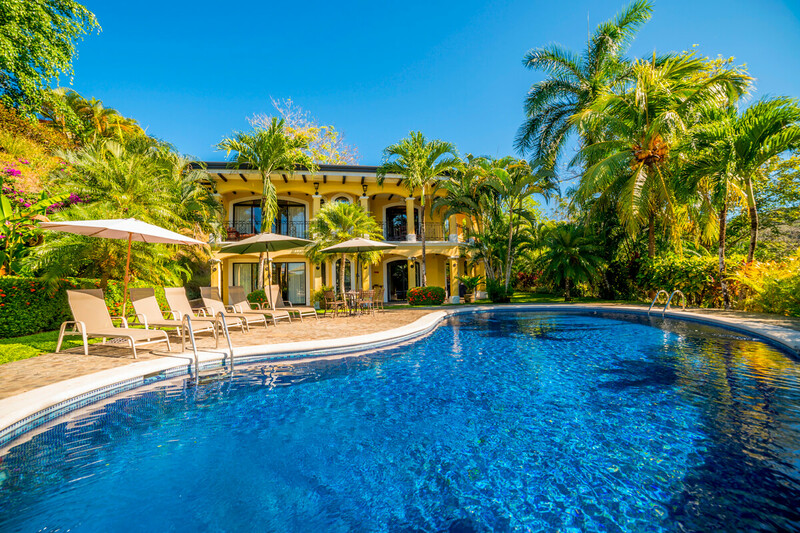 Casa Patron is a split-level home designed for large families, corporate retreats, and groups of friends. Its central location in a gated community take this classic Caribbean villa to the next level. Lush, tropical landscaping surrounds the curved pool, and a lounging terrace runs along the side. On the veranda, there’s a BBQ grill and a wrought-iron dining set. Sliding glass doors lead into the open-concept living room and kitchen. The living room has a 40” LED flatscreen TV and a sound system. The fully equipped kitchen has stainless steel appliances, a breakfast nook, a coffeemaker, and a blender. There’s also a long dining table on the other side of the kitchen countertops. The office offers a desk, high-speed internet, and phone. Casa Patron’s laundry room has a washer and dryer. Housekeeping visits daily from 8 am - 5 pm. Just off the foyer, there’s a suite with two queen beds, garden views, and an ensuite bathroom. Near the kitchen, there’s a king suite with garden access and an ensuite bathroom. The hallway near the dining room holds two suites with two beds in each. One has two twins and one has two fulls. These suites share a hall bath, and are tucked out of the way from the other suites. Upstairs, there’s another suite with two full beds and a king suite with its own balcony and ensuite bathroom. The game room is on this level as well, and comes furnished with a pool table, a poker table, darts, a decorative slot machine, a 50” HDTV, and a wet bar. All six suites have an LED TV. Casa Patron is within walking distance of the La Iguana Golf Course, and a short drive from several restaurants and activities.